Harrogate’s leading body dedicated to defending the Stray has called for a more “robust approach” after one of the worst years for vandalism in the town centre for many years. The Stray Defence Association’s chairman, Judy d’Arcy Thompson said she had contacted Harrogate Borough Council’s parks and environmental services department and Harrogate and Knaresborough MP, Andrew Jones. An example of the damage caused by a vandal attack on a tree on the Stray. 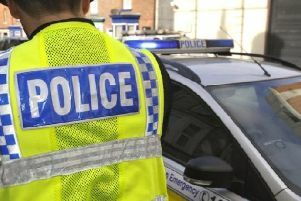 As a result, the MP had now promised to contact the Police and Crime Commissioner for North Yorkshire calling for a more robust approach to resolving the problem. Judy d’Arcy Thompson said: “Clearly it is a minority doing this and they need to be stopped. As recently as October, the Stray saw an outbreak of vandalism where trees were burnt and saplings broken while in September cherry trees were attacked on the Stray near Tewit Well. The summer months as a whole also saw a spate of vandalism in Valley Gardens, on West Park Stray and at Library Gardens off Station Parade. Since it was first formed in 1933, the The Stray Defence Association has vowedto safeguard Harrogate’s Stray against building and encroachment from all quarters - while uphold the Act granting freedom of the Stray to all people for all time. Along with many local residents, members of the SDA say they have been saddened and shocked by the recent wanton vandalism of saplings and benches on Harrogate’s Stray. The Stray Defence Association chairman said it was time for more action. Judy d’Arcy Thompson said: “The SDA is appealing to anyone who witnesses damage being caused to, please, report it to the authorities. The voluntary organisation’s pleas follow concern expressed by a local councillor. Coun John Ennis (Con, Stray ward), said: “The Stray is one of the most-loved features of Harrogate, and its trees are a large part of what makes it so special. “Local people were distressed and angered recently to see this vandalism. These trees had been paid for by local people.